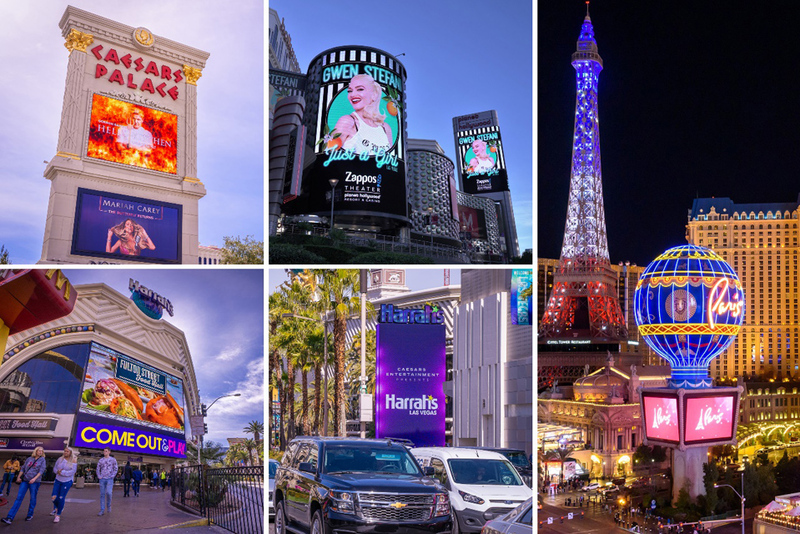 Daktronics of Brookings, South Dakota, recently partnered with Vision Sign, Inc., of Las Vegas, Nevada, and Caesars Entertainment for new LED display installations at multiple Caesars Entertainment-owned properties. Daktronics, in partnership with Vision Sign, Inc., installed more than 21,000 square feet of LED video at four renowned Caesars Entertainment resort locations in Las Vegas. The exterior signage renovations were completed in late 2018 and early 2019. Planet Hollywood Resort & Casino: Daktronics, in conjunction with Vision Sign, Inc., installed a large marquee pylon display and an exterior building-mounted display in late 2018 at Planet Hollywood Resort & Casino. The marquee display measures 76 feet high-by-101 feet wide with a continuous curve around one side to create a double-sided feature. The other exterior display is mounted to the building’s façade with a barrel curvature. It measures 57 feet high-by-34 feet wide. Harrah’s Las Vegas: A four-sided marquee featuring 15HD technology on all four sides and measuring approximately 49 feet high-by-65 feet wide dramatically modernizes its predecessor. At the top of the marquee, a Harrah’s channel logo display comes alive with the help of Daktronics 35-millimeter freeform LED elements that populate the approximately 6.5-foot-tall-by-24-foot-wide display. In addition, Harrah’s Las Vegas north entrance features two wall mounted screens. A 10-millimeter screen measuring approximately 7 feet high-by-44 feet wide is positioned beneath a 15HD display measuring approximately 33 feet high-by-44 feet wide. These displays welcome guests with dynamic marketing content. Caesars Palace: The Caesars Palace flagship marquee was also revamped with the static and digital screens trading positions. 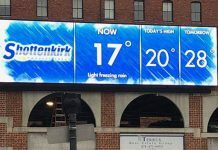 The marquee now features two new sides of large 15HD video, each measuring 32 feet high-by-44 feet wide. Paris Las Vegas: Paris Las Vegas’ new video displays consist of three sides, each measuring approximately 26 feet high-by-37 feet wide. Daktronics 15HD video technology replaced the previous stationary flex faces inside the ‘basket’ beneath the iconic Paris Balloon Monument Marquee. The new displays are visible from all angles of the Las Vegas Strip to cars driving by and pedestrians walking on either side of the street. Top Left to Right: Caesars Palace Marquee, Planet Hollywood Resort & Casino Main Marquees, Paris Las Vegas Balloon Monument Marquee, Harrah’s Las Vegas North Entrance, Harrah’s Las Vegas Four-sided Marquee. The new displays allow each respective venue to show on-premise advertising and branding, while also promoting upcoming shows, concerts, events, current tenants, restaurants, and more. The control functionality allows for scheduled content and adjusting content at a moment’s notice.